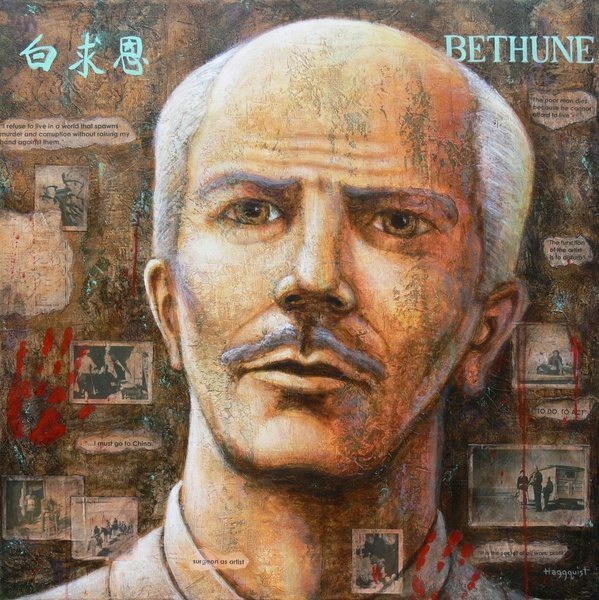 "Bethune" by Gary Haggquist. Acrylic and collage on canvas, 36"x 36", 2008. Some of Stephen Harper’s Conservative backbenchers flew into a rage this summer upon learning the federal government was spending $2.5 million on a new visitors’ centre at the Norman Bethune Memorial House in Gravenhurst, Ont., the birthplace of the famed battlefield doctor 170 kilometres north of Toronto. The outraged Tories complained Bethune (1890-1939) was a Communist, so federal tax dollars should not be spent to honour his memory, even though the Gravenhurst centre is a magnet for tourists, especially from China, who hold a more positive view of the doctor lionized by Mao Zedong.